His shield was named Ironback. History: (Hulk Comic#51/2 (fb) - BTS) - For countless millennia Gafael maintained a ceaseless vigil on the bridge of Camelot, ready to warn the warriors within should strangers arrive or enemies threaten. At some point during that period he met Gargantua, an immense rock troll created by Merlyn the magician; much later Gargantua was seduced away by the enemies of Camelot. (Hulk Comic#51/2) - Gafael sounded his horn to alert the defenders of Camelot of the approach of a mounted knight leading a bound Gargantua. As some of them raced out to join him on the bridge, Gafael challenged the rider, who proclaimed himself the Black Knight, Merlyn's champion, slayer of dragons and wielder of Excalibur. Gafael's fellow, Owein, scoffed in disbelief at this statement, and made to draw his blade, but Gafael halted his actions with a gesture, and asked to hear more of this dragon slayer. It was Gargantua's words that ended the matter, however. Stating that the gathered defenders all knew him and his power, he pointed out that if the Knight could humble him, then they were no match. 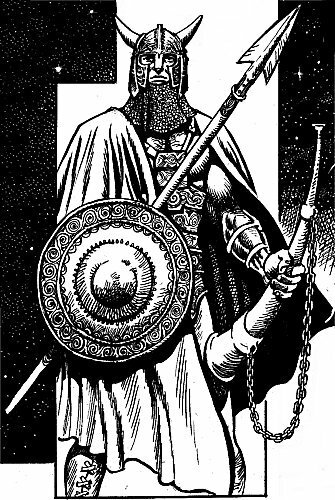 At this Gafael stood aside and waved the Knight in, noting that Camelot needed warriors in these days of darkness. Shortly afterwards, Gafael's horn was heard once more, calling the warriors within the walls to arms. The gatekeeper had spotted a number of elves racing for the safety of the castle, with the "devil's child" Maegog close behind them. (Hulk Comic#52/2) - As the (surviving) elves reached the bridge, Gafael sprinted forward a few paces and launched his javelin with incredible force. It narrowly missed Maegog, impacting in the tree next to where he stood. Seconds later, Maegog's force of trolls arrived. (Hulk Comic#53/2) - While other defenders rushed to get into position, Gafael defiantly stepped forward to face the attackers alone. A hail of arrows bounced harmlessly off his shield, and the first trolls to reach the bridge found to their regret how capable a swordsman he was. But then Maegog and his brother Gog moved up, their trolls parting to let their leaders through. As the two giants charged, Gafael shouted that he would stand firm, but this proved a vain boast. The siblings' impact smashed Gafael to the ground, and he barely deflected a blow from Gog's mace with his shield. Gafael sprang to his feet and delivered a devastating punch to his adversary, but was struck from behind by Maegog's sword, before being buried under a wave of troll warriors. 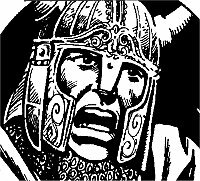 Gog began to pound his mace off the castle gates, but as he did so, Gafael threw off the pile of attackers trying to finish him, and lunged forward. Unprepared for the desperate tackle, Gog fell backwards, and both defender and attacker plunged off the side of the bridge and into the abyss below. Comments: Created by Parkhouse, Neary and Stokes. Gafael is Welsh, and roughly translates as "hold" or "attain". The former definition fits the job of sentry at the gates of Camelot fairly well. Camelot in Otherworld was founded at a similar time to Camelot on Earth / is Camelot of Earth transported to Otherworld, but time moves far faster there, so that 1500 years on Earth is "countless" thousands in the magical realm. I'd go with the latter, as the old myths usually claimed time travelled far faster in the "faerie" worlds. If we take the claim of his "ceaseless vigil" literally, then he is not only ageless, but also doesn't need to sleep, might not need to eat, and hopefully doesn't need to ...umm, carry out certain other bodily functions. True, he could sleep and still stay on the bridge, but that's hardly ceaseless. Food and beverages could be brought out to him. As for the rest, I'm not sure which option is worse - the embarrassment of spending centuries without moving, then missing that attack when it finally came because he'd nipped away for a couple of minutes to the little boys room, or the idea that he might relieve himself off the edge of the bridge into the "limitless abyss". The Black Knight believed that Gafael suspected him (correctly) of having stolen the powers of the dragon he had slain. However there was really no evidence thought this, and the dragon's power, centred in a pearl, was seen on a number of occasions to affect the Knight's mind, making him paranoid about others coveting his prize.